Our fully trained technicians are skilled at reconditioning engines, we are so proud of this service that our re-conditioned engines come with a full 12 months / 12,000 miles warranty(*). We offer a fully re-conditioned exchange engine starting from £695.00 for a 600cc, £795 for the 700cc, all engines are sold on an exchange basis, your exchange unit must be servicable, or a surcharge will apply. We offer a full fitting service for an additional labour cost of £435 + VAT( Roadsters £545 + VAT), plus an extra £95 + VAT for oil, filter, gaskets, seals, spark plugs etc. If neither Option 1 or 2 suit your needs, then we would be happy to purchase your unwell Smart, to rebuild it ourselves and offer it a home. As well as a reconditioned engine you get the choice of having a new water pump. Water pump - £65 plus + VAT. When done as part of a supply & fit package, there is no labour on top of this price. *Warranty conditions apply, call for full details. 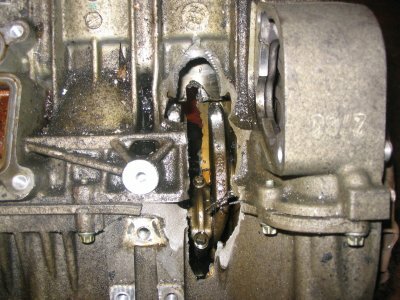 Here are a few pictures of what could happen if you don't get your engine done as soon as possible. 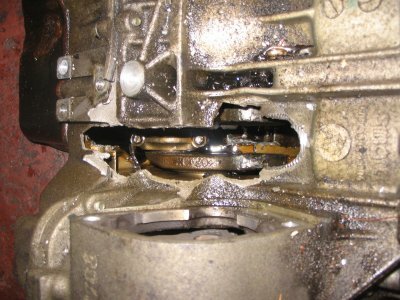 If this happens to your engine you will face a surcharge on top of the price of an engine! A conrod has gone through the block under high pressure.